Wednesday……Thursday……then finally Friday! Not just any Friday, but the Friday my family and I head down to south Georgia to join the Orianne Society for their first annual Indigo Days event. I could hardly wait to meet up with old friends and some new friends, and get to see the Orianne Preserve in person! We made short work of the packing task and hit the road in time to reach our destination for the first night, Little Ocmulgee State Park, by midnight. We coordinated to meet up with Paul Laurent and the rest of the South Carolina crew (who had found Slimy Salamanders and Gopher Tortoises the previous day) at 7:00 AM for breakfast, then a short hike around the park before meeting up at the preserve at 9:00 AM. If you have ever dealt with herpers who are limited in time, you could predict that breakfast was not had, and we braved the 40˚ temperatures to check out the park trails. Despite the less than ideal conditions, we were able to spot a few Gopher Tortoises in their holes before rushing back to prepare for the rest of the day, and meet up with Daniel Thompson and James Blodgett who were waiting at the lodge. Around 9:00 AM we rolled into the preserve, which is prominently marked with The Orianne Society logo. Just passed the gate we entered a savanna of young Longleaf Pines, followed by an open field with several cars and a congregation of those who share my passion. After introductions and a short briefing by Orianne Society’s Dirk Stevenson, we split into two groups. Our group lead by Dirk and Kevin Stohlgren, also with The Orianne Society, headed out into some of the purest remaining Longleaf Pine and Wiregrass sandhills remaining in the world, while the other group headed to the land of the cactus. Shortly after departing, Mandy Johnson and Sharon Yomtob found a perfect and fresh six foot Indigo shed! After the crowd of herpers who descended upon the location of the shed thoroughly searched the area for the snake, it was decided that it had either moved on or tucked itself deep in a burrow. After a close examination of the shed, it was determined that it belonged to a young male, as it had a slight keel on the scales. Our hopes were high, but clouds blocked out the sun as a storm front was moving in keeping snake activity low. Kevin was able to use the burrow camera to spot a few Diamondbacks deep within Tortoise burrows, but the rest of the day was unproductive snake-wise. Micah Riddle, a good friend of mine from Alabama, was able to spot an adult little Grass Frog (Pseudacris ocularis) hopping through a lower area of the preserve. This full grown adult was barely the size of my fingernail, and was an excellent example of the smallest frog in the United States. The area nearby was later found to be the home of Squirrel, Green, and Pinewoods Treefrogs, as well as Marbled Salamanders, a lifer for many people on the trip. Our rendezvous with the other group was at 4:00 PM, and we were pleased to see they had captured an adult female Eastern Diamondback! This was one impressive snake, measuring over five feet in length.Also, the staff had two Indigos at the preserve that needed to be processed: scanned and implemented with PIT tags, weighed, and measured. One of the individuals was an impressive seven foot, and the other was a cute four footer. After enjoying the Indigos and the Diamondback, a massive storm system moved in, triggering amphibian activity. Once again we found ourselves limited in time as Dirk and Steve Spear (also an Orianne staff member) were giving talks on the Indigos and Hellbenders respectively, but the South Carolina crew was able to capture an attractive Ornate Chorus Frog, while Daniel, my dad, and I were able to catch our own Ornate Chorus Frog and a huge Spadefoot! Dirk and Steve gave excellent talks, and we shared our amphibian finds shortly after. By then it was getting late and we were scheduled to get up early and release the Diamondback, so I got to sleep. The next day we headed to cactus land to release and photograph the Diamondback, followed by last minute hunting before heading home. Luckily after splitting up again, the sun came out as we hit multiple spots known for their Diamondbacks and Indigos. At one of these spots, Daniel and I were able to spot his first Diamondback in a hole, unfortunately just out of reach. We continued to explore the area, and prominent tracks outside a Tortoise burrow led Dirk to believe that there was a snake in it. The burrow camera showed the reflective scales of my first wild Indigo deep in the burrow! It was exciting, and disappointing as I was unable to get a good view of it. Meanwhile at the preserve, the other group was able to spot a few more Diamondbacks in holes, and my mom and dad found a Ratsnake in a rotten log! The next area we hit was a massive field, surrounded by sandhills. Here, a second Indigo shed was found by Ben Stegenga, and shortly after Micah Riddle was able to pull a Diamondback out of a small hole! It was an awesome conclusion to an awesome trip! 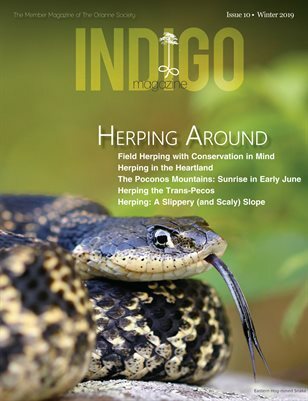 4th Places You’ve Never Herped – Where Are We Herping This Time?